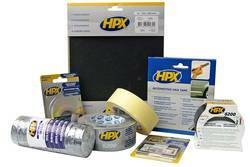 No matter if you want to stick, caulk, insulate, secure or package: The high-quality products of HPX ensure to easily and effectifely perform these tasks. In this category, you will find adhesive tapes for mounting several objects. Various lengths and widths offer a wide range and ensure a reliable adhesion through a double sided adhesive surface. For mounting smaller objects, it is often helpful to use adhesive or velcro pads instead of a tape that needs to be tailored. In this category, you will find three different products. The adhesive tapes of this category represent the perfect problem solvers for reparations of all kinds. Available in different lengths, widths and colours. The duct tapes are caracterised by a high adhesive and tensile strength. HPX insulationg tapes of this category are suitable for electrical insulation and a wide variety of applications. Available in several coulours and types. In this category you will find adhesive tapes made out of crepe paper for masking various objects. Available in painting quality and automotive standard quality. This category offers grinding articles of all kinds: dry and wet sanding papers as well as abrasive pads and foam abrasive blocks. Tapes are also used for safety and marking. In this category, you will find a barrier, safety and reflect tape. In this category, you will find our HPX Alu tape, butyl sealing tape and different versions of packaging tapes. For working with spray paints and tapes, accessory is required. This category provides information about the following products: rubber smoothing spatula, tack rag, dust mask. Broken edges can be quickly glued back together for long-term stability with presto Bodyfiller.